Which sleds from the recent past will be highly collectible/prized 10-30 years from now? Click to read Part One of the story. The Dark Lord definitely knows how to clean. A fan of this site sent this short video of Darth. Anyone else want (or already have) an ArcticInsider decal for a similar promotional purpose (or just to have)? 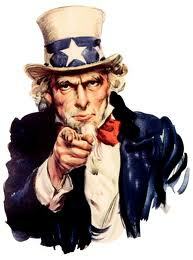 Sign up as a forum member and send me a PM. 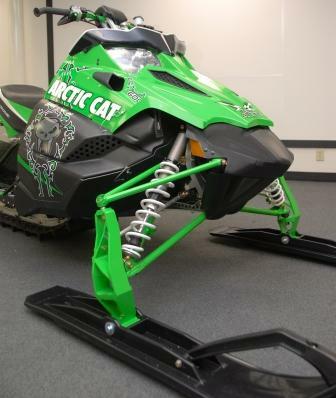 Arctic Cat just released the info and specs on the 2011 Sno Pro 600 SX and XC models. Besides the usual durability refinemens that happen every season, the big news for '11 is a new track for the snocross model, a reprisal of the clear fuel tanks, and some shock recalibration. Our awesome Scandinavian correspondent, Joni Launonen, sent ArcticInsider a dispatch about some new, big additions to Team Arctic. What Do Vikings Cheerleaders Know, Anyway!? I want to thank everyone who checks out this Website. It's been a HUGELY satisfying. I just wish beautiful NFL cheerleaders knew more about it. Action Graphics Could Sponsor YOU! Gary at Action Graphics recently notified me that he's looking for a few good racers to sponsor. I know Gary, thus I know he's looking to give away the store. While on my recent trip to TRF, I got to check out a fraction of the sleds, parts and stuff of longtime Arctic Cat collector/seller, Gene Sauve. I'm back from a few days at Arctic Cat in Thief River Falls. As usual, there's always fun stuff and great people to see. Why So Few Wild Custom Sleds? 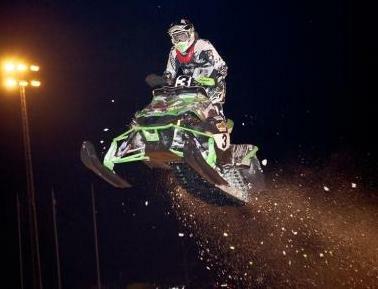 Will future Arctic Cat snowmobiles look anything like this? Will wild, custom sleds become popular like their motorcycle counterparts? Team Arctic racing legend Brian Nelson is back at it. Literally. He's race-prepping three 1979 Arctic Cat el tigre Cross-Country Cats for the vintage class in upcoming USCC I-500 cross-country. I spent a day in his race shop. Click to see the pix. The vintage class for the 2011 USCC I-500 cross-country looks like it's going to be HUGE, with some very familiar (and famous) names. Click to read the release from USCC. 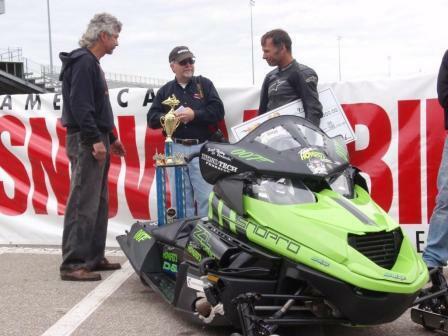 Team Arctic snocross racer and Arctic Cat fanatic John Zanon of Norway, Mich., sent us these photos from the Eagle River World Championship Snowmobile Hall of Fame, where a cadre of famous names were recently inducted. Check out the sleds on display. 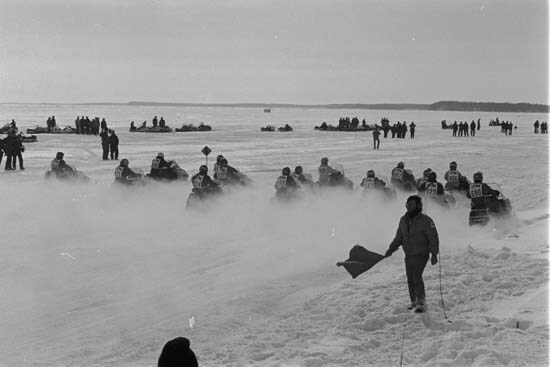 In conjunction with their open house, Country Cat in Sauke Center, Minn., is hosting an all-Arctic Cat vintage show on Sat., Oct. 2, from 8 a.m - 3 p.m.
147 mph with a 8.57-second ET! Sometimes the Better Question is "Why Not?" Sometimes the better question is, "Why Not?" Definitely the case with this project of passion. Of all the riding I've experienced in my many, many years of snomwobiling, two of my favorites are nighttime and being lost. This brief moment, from what appears to be the 2000 I-500 cross-country, illustrates the importance of paying attention to the double-down arrows. And to ALWAYS throttle-back when you see someone pointing a camera at you. Arctic Cat had a pretty amazing Haydays grass drag performance... on the same weekend that Billy Howard set a new speed record for a stock sled. 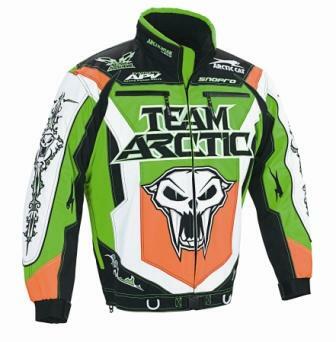 Every month throughout the season, Arctic Cat sends out press releases on new products of theirs that riders are interested in. Click the header to see what new stuff is available. 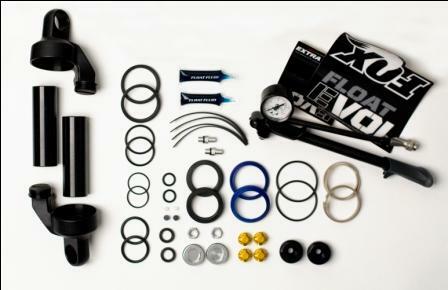 I saw a lot of cool stuff at Haydays, including this sweet, $350 FOX EVOL upgrade kit that's seems aimed at Sno Pro-package Arctic Cats. Click to learn about it.